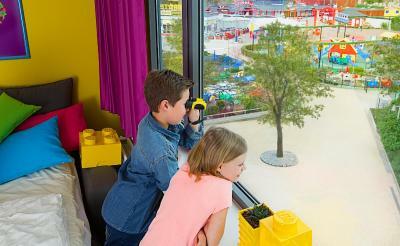 Lock in a great price for Hotel Legoland - rated 8.2 by recent guests. Good value for money, plenty of Lego to play with for the kids and a games room with free pool table, computers and table football. Good breakfast as well! a lot of LEGO everywhere. and a small aquarium in hotel. I went with my daughter ( who is twelve ) and she was absolutely amazed. 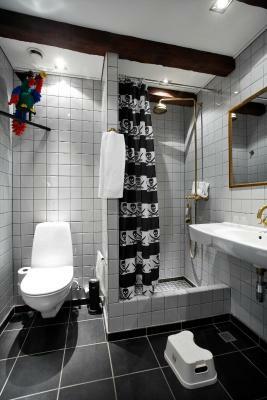 This is a must if you are staying in Bilund nay Denmark. Though a tad dusty, the figurines in the hotel are beautiful and the entrance is majestic. Just great. 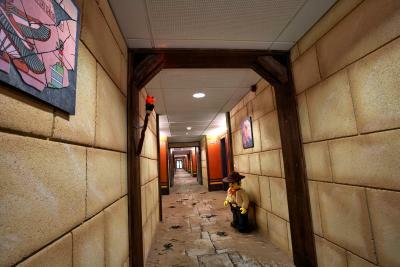 There are different sections of the hotel such as pirates, ninjas and lego friends. 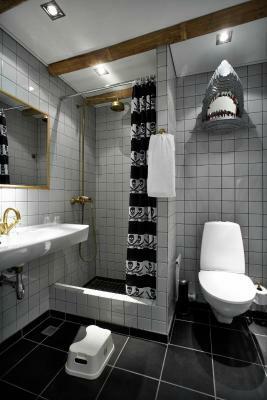 Staff were friendly and room was quite fun because of the theme. The room itself was a good size as well. It was also nearby both Legoland and Lalandia, plus nearby the bus station. The town was also a short 10-15 min walk away. Very kind receptionist! Because we arrived earlier she managed for us to check-in earlier also! 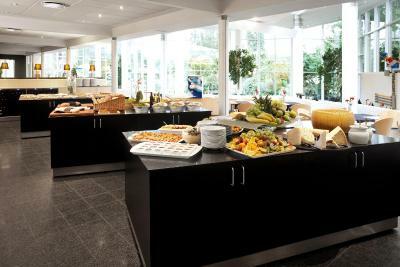 Very nice breakfast also! Thank You! It was an amazing experience, not simply staying in the hotel. Everything is well-designed, people take care of the details here. The staff was very friendly and professional. 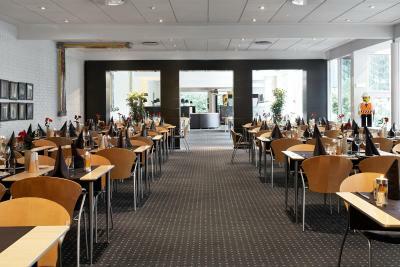 I enjoyed the breakfast, it starts early (6 AM). In addition, there's a great house on the tree guarded by the dragon. The breakfast was various and very good! The different competitions for the children were super! 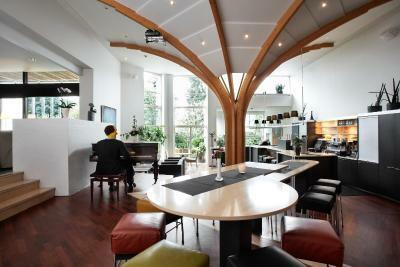 WII and billiard are also a plus! This family-friendly hotel features free sauna and gym access. It has a private entrance to the popular Legoland® Billund Theme Park, open between the end of March until October. 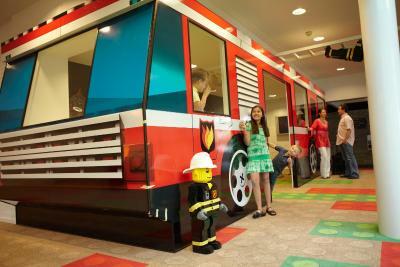 Rooms include free WiFi, flat-screen TVs and Lego gifts for all children. 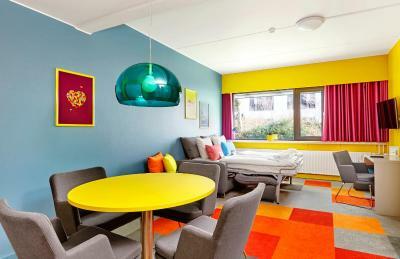 The colourful rooms of Hotel Legoland® include a tea/coffee maker and a child-friendly bathroom. 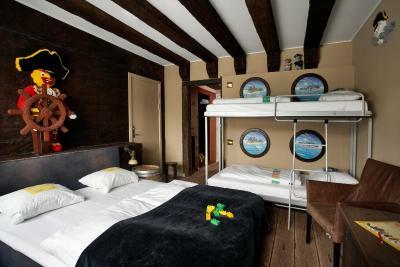 Many rooms offer great views of the theme park, while some also include themed décor with play tables and Lego bricks. 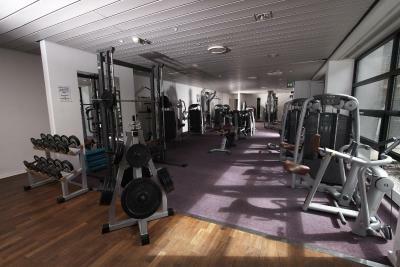 On-site children’s facilities include a playroom, playground as well as numerous activities. There is also a shop with the most recent Lego products. 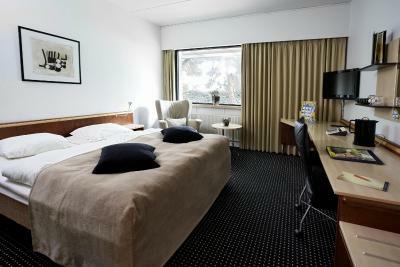 The hotel is only 900 yards from Lalandia Water Park, and Billund Airport is less than 10 minutes’ drive away. Free parking is possible at Hotel Legoland®. 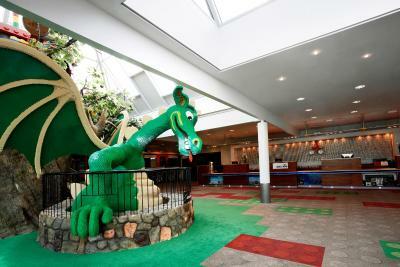 Hotel Legoland has been welcoming Booking.com guests since 24 Aug 2008. 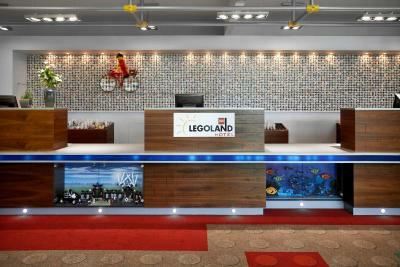 When would you like to stay at Hotel Legoland? 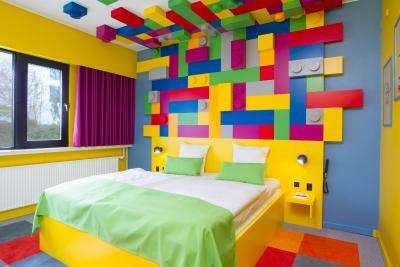 These spacious rooms feature Lego-themed décor, a well as a flat-screen TV, minibar and electric kettle. 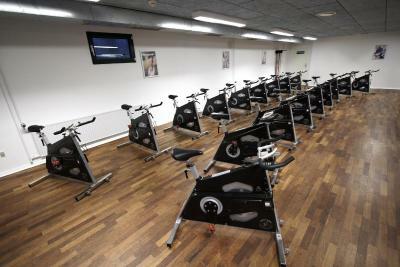 This room is suitable for 2 adults + 4 children up to 12 years old. Please let the hotel know how many guests will be staying and the age of the children. You can use the Special Requests box when booking. 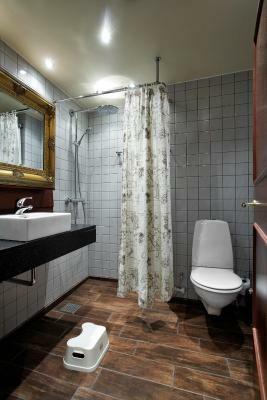 Features a separate bedroom and seating area, as well as a large bathroom with a bathtub. 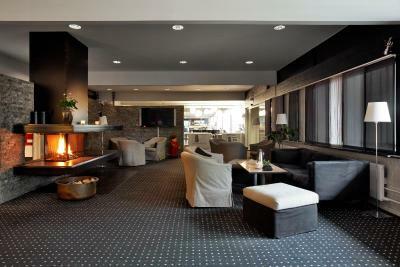 Also includes a flat-screen TV, minibar and tea/coffee facilities. 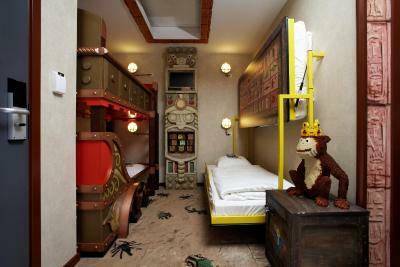 These rooms feature pirate Lego-themed décor, a well as a flat-screen TV, minibar and electric kettle. 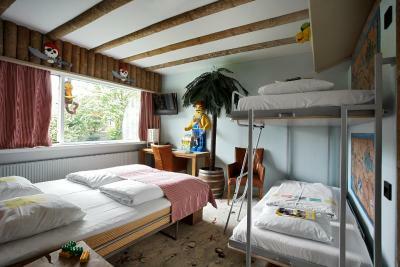 This room is suitable for 2 adults + 2 children up to 12 years old. Please note that the bunk beds are each 160 cm long. 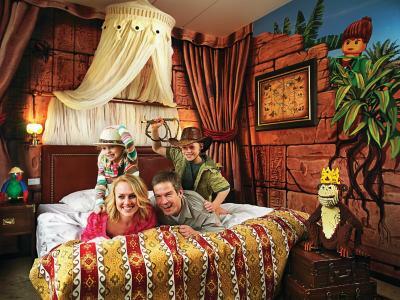 These rooms feature kingdom-themed décor, as well as a flat-screen TV, minibar and electric kettle. 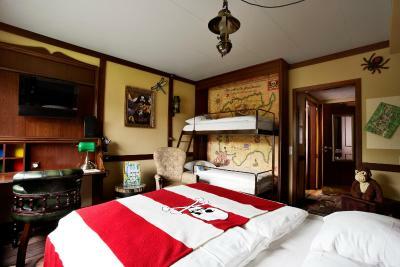 These rooms feature Heartlake city-themed décor, as well as a flat-screen TV, minibar and electric kettle. 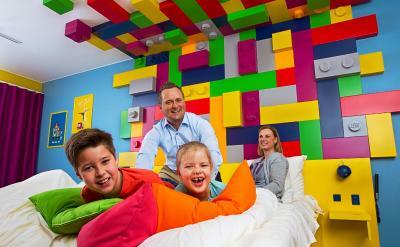 These rooms feature ninja Lego-themed décor, a flat-screen TV and electric kettle. 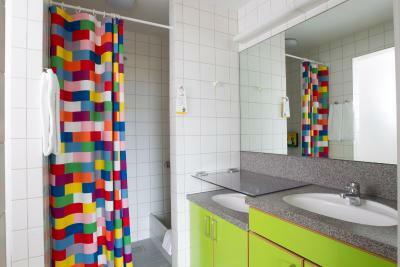 Features views of the Legoland® Billund Theme Park and wall of Lego bricks, a flat-screen TV and electric kettle. 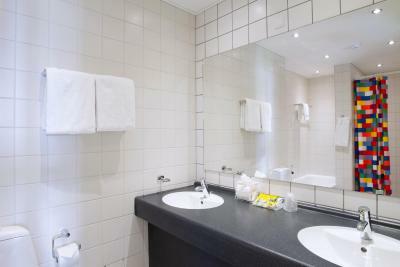 Located next to the conference centre, these business rooms feature a work desk and a flat-screen TV. 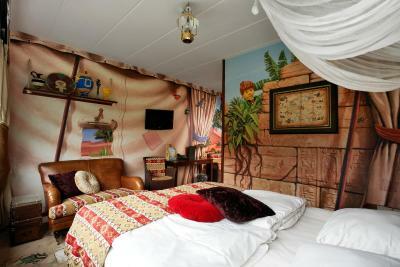 These rooms feature princess-themed décor, as well as a flat-screen TV, minibar and electric kettle. 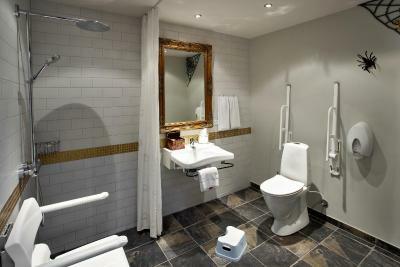 Features knight and medieval inspired décor, as well as a flat-screen TV, minibar and electric kettle. 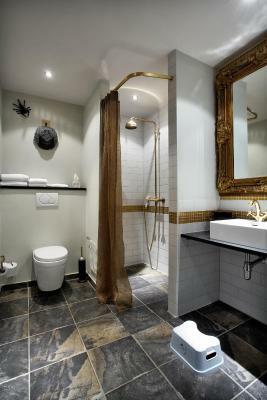 Features décor inspired by treasure hunting, as well as a flat-screen TV, minibar and electric kettle. 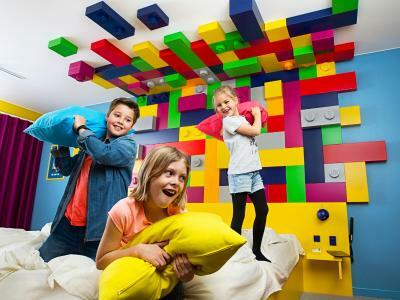 Get even more LEGOLAND® The 4-star Hotel LEGOLAND® places you smack in the middle of the funniest land ever. 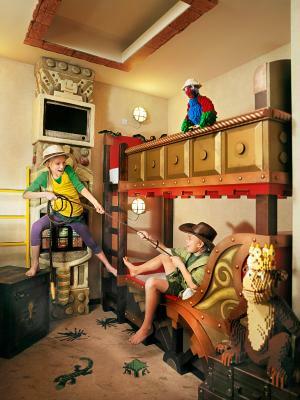 You can stay as pirates, princesses, knights, adventure heroes or with the girls from LEGO® Friends in our cool LEGO themed rooms. 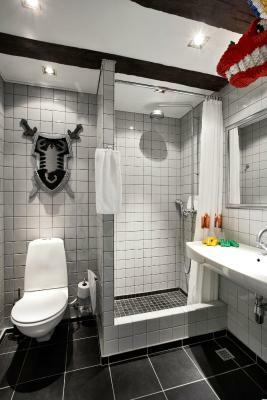 House rules Hotel Legoland takes special requests - add in the next step! 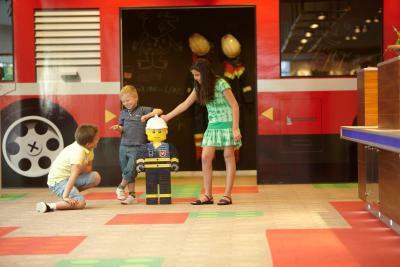 If you expect to arrive after 18:00, please inform Hotel Legoland® in advance. Please note that credit card fees may apply when booking non-refundable reservations with a credit card. 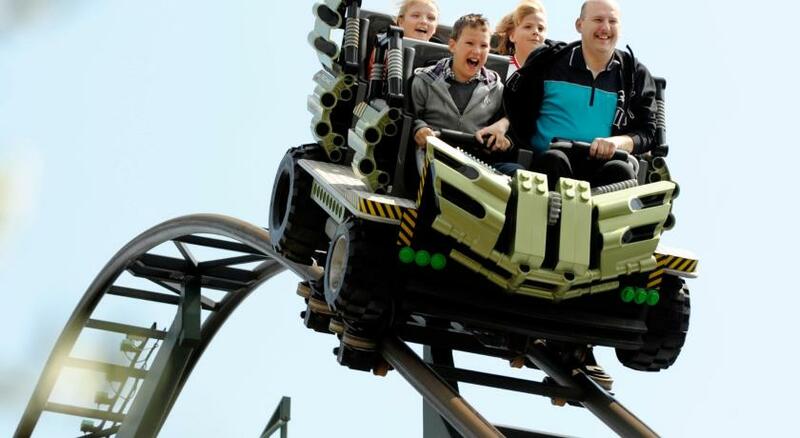 Legoland® Amusement Park is usually closed from November until March each year, as well as certain days throughout the year. Guests are advised to check the exact opening hours in more detail. 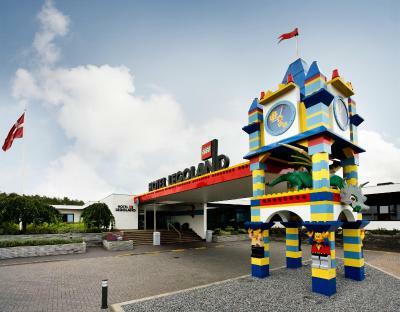 Please note that entrance to Legoland® Theme Park are not included.The hotel's reception sells discounted 2-day tickets to Legoland® Theme Park. Please contact the hotel for further details. If needed, guests can print a receipt via their booking confirmation. low ceilings. 60s rugs and furniture and lamps. The atmosphere and decor was fun. Poor lighting in the room, even with all the lights on it was still quite dark! Cleaning and dusting all the LEGO decorations must be a nightmare for staff and this was evident also in the room. Everything was dusty. Close to LEGO land and lalandia. the pirate room is small and dim. It was a little bit dusty all around but it was definitely worth it. I cannot think of any other negative points about this great hotel. The restaurant had extremely few options. For vegetarians there were just 2 options and the prices were quite high. Even things such a tap water had a charge (unless you bought a bottle of wine). Wish I would have gone elsewhere for dinner as I ended up overpaying for a standard veggie burger. Fabulous breakfast and lovely staff.